Highlights from GTM Research analyst presentations at Solar Power International. 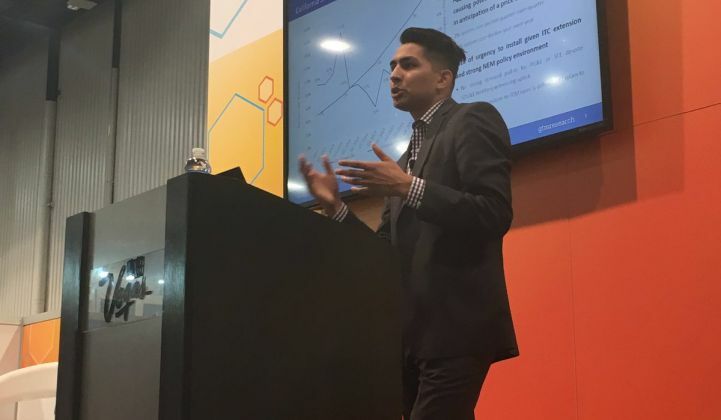 Last week, GTM Research analysts presented at Solar Power International's Industry Trends Theater. If you missed the presentations or the show, here are a few key takeaways. 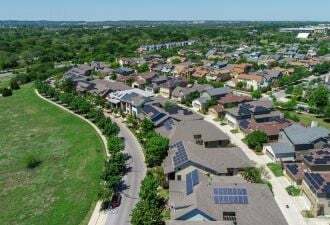 According to GTM Research solar analyst Austin Perea, growth in perennially leading residential solar states like California and New York is beginning to slow. 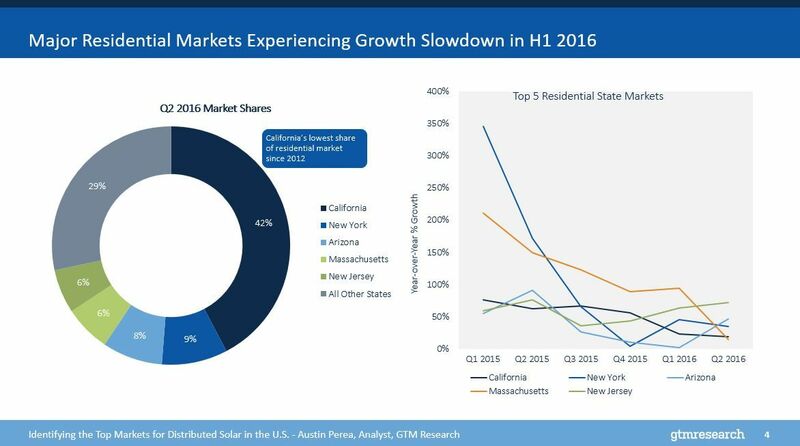 In fact, in this past quarter, California held on to its lowest share of the residential solar market since 2012. However, with the help of some emerging state markets, the residential segment did manage to grow both year-over-year and quarter-over-quarter. States on the upswing, according to Perea, include Texas, Utah and Rhode Island. 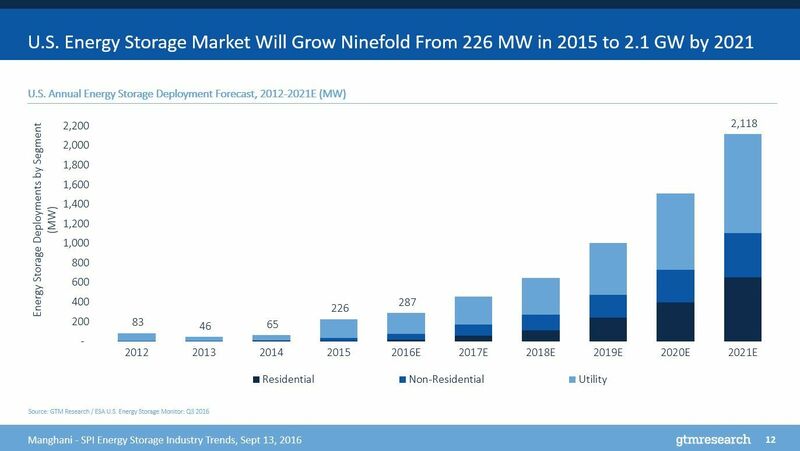 Most impressively, GTM Research forecasts that Texas will install 70 megawatts of residential PV by the end of this year, up from 31 megawatts in 2015. 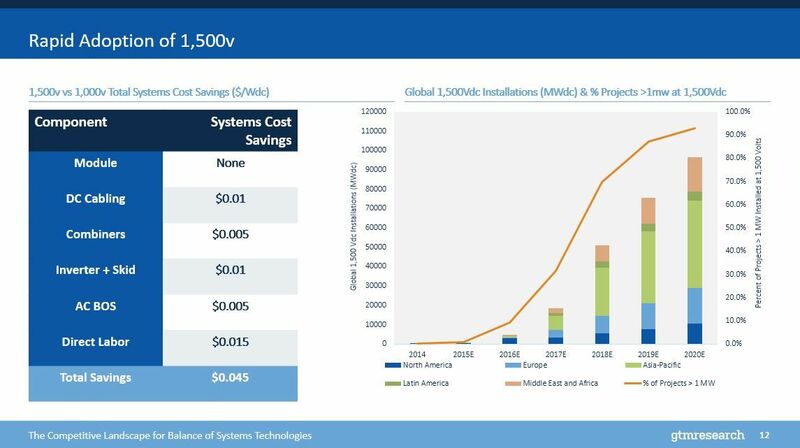 GTM Research Solar Analyst Ben Gallagher notes that 1,500-volt systems offer system savings of nearly 5 cents per watt. "Adoption of 1,500-volt systems is the lowest-hanging fruit to reduce balance-of-systems and overall systems costs," said Gallagher. 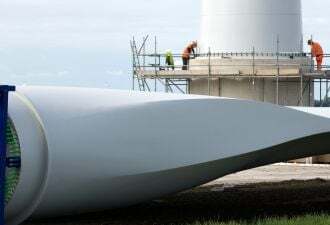 The cost savings will result in widespread adoption, and by 2020, GTM Research estimates that 93 percent of all utility-scale projects will use 1,500-volt systems. The U.S. energy storage market will grow to 2.1 gigawatts by 2021, with a valuation of $2.9 billion. According to Ravi Manghani, GTM Research's director of energy storage, "The behind-the-meter sectors will grow from a 15 percent share in 2015 to account for a quarter of the deployments this year, and will become a much larger share of the market by 2021 at 52 percent." China experienced a monumental first half of 2016, with 21 gigawatts of PV installed across the country. This has resulted in a weaker-than-expected second half in terms of PV demand. 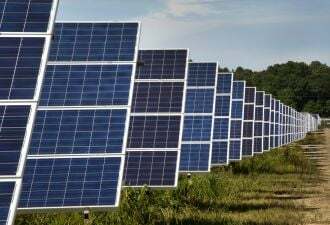 "As new capacity ramps up, suppliers are looking to get rid of inventory," said Jade Jones, a senior solar analyst with GTM Research. "Additionally, there are little prospects of other regions offsetting the decline of Chinese demand." 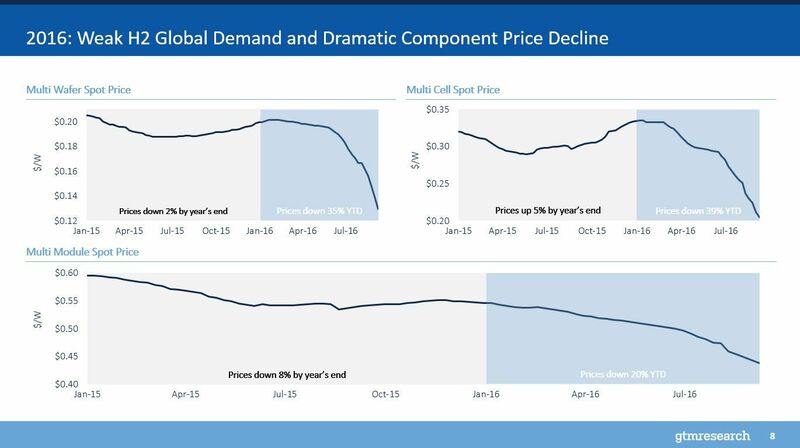 As a result, module spot prices have fallen 20 percent so far this year. Want exclusive access to GTM Research's reports, data and analysts? Contact subscribe@gtmresearch.com to learn about our subscription options. You can see our analysts present at the U.S.Solar Market Insight Conference in San Diego. See the speaker line up here.